Over Thanksgiving dinner I told my dad that self-employment was no easy task – it turns out that starting a wealth management firm is not for the faint of heart. But my dad is a poor candidate for sympathy, and so he told me that if I wanted to make grown man decisions I had to pay the grown man price, and then he asked me to pass the gravy. The month of January reminded us of the many skeletons sitting dormant in our closet, even if the usual suspects had less to do with the volatility than you’d think. For instance, nobody can deny the impact that performance enhancing drugs have had on the achievements of professional athletes, and so it’s natural to assume that Wall Street benefited from a remarkably similar cocktail of quantitative easing, stock buybacks and record levels of margin debt, even if they weren’t to blame for the recent decline. Case in point, the Federal Reserve’s balance sheet increased from $850 billion in 2009 to more than $4 trillion because they purchased bonds from the balance sheets of banks. These savvy financial institutions used some of the proceeds to invest in the market, and without arguing the sinuous relationship between paper money and profits, it is no coincidence that the market surged at the start of all three phases of quantitative easing and swiftly retreated at their conclusion. Oddly enough, bond prices have shown no ill-effects in the wake of less demand from the central bank and we’ll need another scapegoat for the latest hiccup. Manufacturing currency out of thin air is one thing, although companies have engaged in their own form of financial engineering, buying $500 billion of their own shares in 2013, which is two percent of the S&P 500’s market capitalization and almost 50 percent of what the Fed spent last year. Stock buybacks not only created artificial demand, but decreased the supply of available shares. That might explain the pullback, except the practice shows no signs of slowing down. Demand for stocks is coming from the all sorts of familiar places. Margin debt has soared to over $400 billion on the New York Stock Exchange, fully 50 percent higher than the level in January 2012. 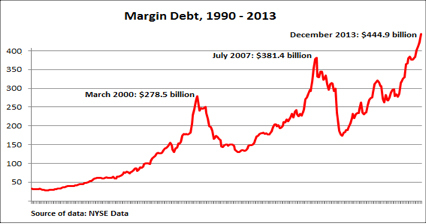 The last time margin debt reached these heights was in 2007, and before that was the year 2000. Investors have deliberately pledged equities with inflated values as collateral to purchase even more stock in hopes that others behind them will share their sense of optimism. There is no evidence that any of these forces can be moderated without ultimately triggering a correction, yet it doesn’t appear that they were the source of recent volatility. Likewise, emerging markets received heaps of foreign capital once quantitative easing reduced U.S. interest rates and made international assets more attractive. Now that the tide has reversed, some believe their quagmire is the source of so much unease. The chickens have indeed come home to roost, as many of these nations find their currencies in sharp decline now that the tapering has begun and investors can get better deals at home. Emerging countries are essentially faced with raising their own interest rates at the expense of economic growth or suffering the consequences of both inflation and a flight of capital. Judging by Turkey’s experience with both options, there doesn’t seem to be an immediate remedy available. The interrelated web of exchange rates and foreign trade has stamped its temporary mark of disapproval on the global markets. Nevertheless, the dreaded emerging market contagion has yet to materialize, and on its own merit, is not solely to blame. Having said all of that, the transition from communism to capitalism can be quite the bumpy ride, and in an effort to match the industrialized world’s penchant for questionable behavior, China has expanded its manufacturing prowess to include stock market volatility. At the heart of the matter is a central bank that caps rates that banks can offer depositors. Unfortunately, high inflation in 2011 meant that depositors saw negative real returns on their savings, and what a bummer that must be. In an attempt to limit outflows, Chinese banks summoned the ghost of Houdini and offered one-year rates that were significantly higher than the standard deposit. 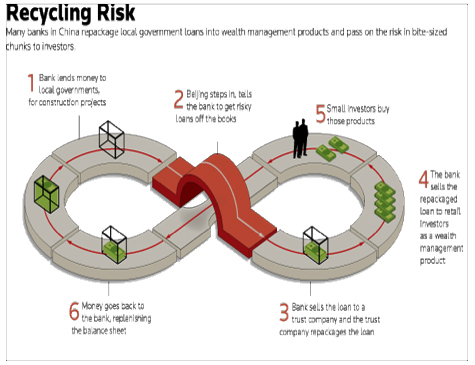 Chalk one up for U.S. innovation – in some instances the Chinese banks lent real estate developers and LGFP’s money at 14 percent, repackaged the loans into opaque retail products, sold those products to depositors who received six percent and then pocketed the difference. In order to generate these higher returns, banks circumvented regulations with complex financial transactions and off balance sheet trust companies – what could go wrong? If you’ll recall, on May 22nd of 2013, Ben Bernanke announced that the Federal Reserve would begin winding down quantitative easing in the near future. The markets dropped by an estimated six percent and gullible pundits like myself promptly blamed it on tapering fears. This was a convenient and plausible explanation, except that by the middle of June the markets had recovered. In the first six months of 2013, however, 65 percent of these retail products (that were 14.5 percent of the banking system deposits) had maturities of three months or less, while the lifespan of LGFP’s responsible for paying back the principal were significantly longer. The timing of the maturities, therefore, didn’t correspond with one another and this created a liquidity crunch when depositors came looking for their money. In June of 2013, the People’s Bank of China (PBOC) refused to reward iniquitous behavior by bailing out the banks, which caused massive interest rate spikes as high as 30 percent. It’s one thing to show tough love and evict an irresponsible child; quite another to deny him reentry with a police car waiting in the driveway. 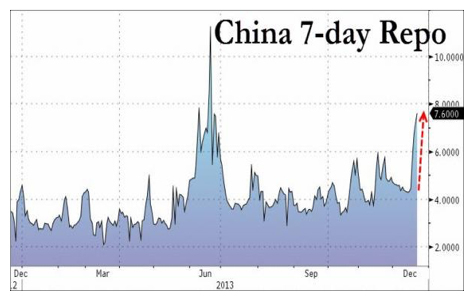 Nobody can say for certain what impact this cash crunch had on our markets once Chinese banks began selling securities to create liquidity, but suffice it to say the markets dropped seven percent in late June and immediately recovered after the PBOC relented by injecting cash into their banks, a procedure they have since repeated several times. Investors are apt to blame the latest bout of volatility on the Federal Reserve and emerging market currencies, but China’s surging repo rates in January approached those of last June due to a scheduled $495 million default at the beginning of this year. China’s ability to address this ongoing predicament will go a long way in determining the fate of the emerging markets that depend on exports to grow their own economies, currency concerns notwithstanding. And since we’re all in this global economy together, the domestic markets are paying close attention as well. Fortunately, the PBOC has been willing thus far to bail out shaky LGFP’s on the verge of default and there’s reason to believe they have sufficient reserves to address future concerns. It’s worth mentioning that in response to the aforementioned risk, a small slice of the portfolios have been short emerging markets with the position (EUM) since mid-July, losing five percent in 2013 and appreciating five percent in the month of January. Please note that the portfolios have also been hedged against other adverse outcomes for several months. After all, nobody rings a bell at the top. The volatility index, often referred to as the fear index, shows the market’s expectation of 30-day volatility. It is the sage advice from a wise parent that teenagers cannot possibly appreciate until they reach adulthood. The position denoted by the symbol (VXX) has been unappealing to say the least, but it increased by over 20 percent in the month of January when the market dropped by 3.6 percent, albeit a slight footprint on the overall portfolio. Although trading at over $50 as of this writing, it reached the equivalent of $7,500 a share in 2009 and represents unconventional insurance against a severe crisis for a very reasonable cost. Given what we know about all of our competing options, the U.S. market appears to represent the best opportunity for growth, despite the skeletons sitting in plain sight. It has been my approach, therefore, to use individual securities in an attempt to capture upside opportunities and compensate investors for the hedges that have served their purpose. While on one hand AAPL, DDD, AKRX and HD were disappointments, the gains from BIDU, MMM, ARRS and MTW more than compensated investors for the adverse selections, and when considered as a collective group, the good and the bad, delivered weighted returns above and beyond what the market had to offer without the expense of a mutual fund. Depending on one’s allocation, an estimated 60 percent of the portfolio holdings have seen no changes over the previous six-months, individual equities accounting for all of the buying and selling activity. Once a security hits a price target or breaches a technical level that suggests it could depreciate further, a sell order is entered. Maintaining a disciplined exit strategy is as important as the selection process itself and can be credited for the decision to liquidate several stocks at the end of December and the beginning of January before the markets began their descent. Buying previous winners on sale after a pullback is also not out of the question. And then there’s gold, a minor position that was last year’s black sheep of the family and this year’s prodigal son. Without debating the merits of loose monetary policy and scurrilous government debt projections, we can all agree that 70 million baby boomers expect to receive their social security and Medicare benefits and politicians enjoy being reelected. Moreover, there are two types of gold at the COMEX: eligible and registered – the latter is the only gold available for delivery at that COMEX and the inventory is the lowest it has been since the beginning of 2008. In the final analysis, the air may come out of the balloon a little bit at a time or it may ultimately burst in frustration, or better yet, maybe there’s no bubble at all. Nobody should be surprised either way, and if we’re to be honest, these issues have already been accounted for. Should the markets recover, as many expect they will, then we’ll be no worse for our wear. Securities offered through LPL Financial, Member FINRA/SIPC (http://brokercheck.finra.org/). Investment advice offered through Delancey Wealth Management, LLC, A registered investment advisor and separate entity from LPL Financial. The opinions voiced in this material are for general information only and are not intended to provide specific advice or recommendations for any individual. To determine which investment(s) may be appropriate for you, consult your financial advisor prior to investing. All performance referenced is historical and is no guarantee of future results. All indices are unmanaged and may not be invested into directly. The opinions expressed in this material do not necessarily reflect the views of LPL Financial. The LPL Registered Representative associated with this site may only discuss and/or transact securities business with residents of the following states: AZ, CA, DC, DE, FL, IL, KS, KY, MA, MD, MI, MN, NJ, NY, OH, PA, TN, TX, VA and MO. Securities offered through LPL Financial, Member FINRA/SIPC. Investment Advice offered through Delancey Wealth Management, LLC, a registered investment advisor and separate entity from LPL Financial.